This eye-catching Colorado business center features great views of the Rockies and is situated on a notable campus, among companies from a range of industries. It is in view of I-25 and the rest of the area's local transportation networks mean that the center is easily accessible from any part of the region owing to its excellent range of convenient services in operation across the area's extensive road and rail networks. With corner office suites that provide great views of Pikes Peak and the Colorado mountains. Located directly opposite the Citadel Mall on one of the busiest intersections in Colorado Springs tenants benefit from on-site management. This center boasts breathtaking views from one of the highest buildings in the area. A tremendous range of amenities is available in the building and close-by, including up-scale restaurants, cafes, and fitness center (free for office clients). 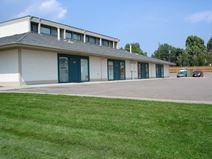 Set at the core of downtown Colorado Springs, this is an excellent address for your business. Want the flexibility of co-working but need a more private, dedicated space to use? Check out the Value Center where you’ll have the same perks you receive from being a co-working member but with the added benefits of having your own dedicated desk with a locking cabinet in a more private space at a value rate! The Virtual Office solutions give you the appearance of a large corporation while still having the flexibility to work from home or travel! You’ll have an address at an illustrious location, professional, friendly staff to handle calls and greet your guests, a secure mailbox, private office use, meeting room and conference center access at member discounted rates, and much more! Centrally located in downtown Denver, this elite business centre is city’s most sough-after addresses. These high-end executive suites are fully furnished and are available on a full time or part time lease agreement. With the added convenience of the most up-to-date technology, business support, staffed lobby, onsite fitness centre and free parking, theses beautiful offices to rent are just seconds away from several upscale restaurants, 5 star hotels, and recreation and entertainment venues.